Our core muscles and joints can become quite weak in daily life as we adopt habitual poor posture. The core muscles are the deep, stabilising muscles of the abdomen and back which support the spine. A weak core means that the spine is not supported properly. Over time the large muscles in our bodies become overused as they try to compensate, becoming overstretched, shorter or tighter and begin to signal their discomfort by becoming painful. If we ignore the signals, our joints become out of alignment, painful and prone to further injury. Regularly practicing Pilates exercises can change these unhealthy movement patterns. The new movements develop the strength of the core and pelvic floor muscles and improve mobility and flexibility at the joints. We start to move better. build a stronger and more stable core. re-train your body so that it begins to support efficient, graceful movement in your everyday life. improve your balance, co-ordination and control. de-stress and release tension. You should leave a class feeling refreshed and at peace. begin to lengthen, strengthen and tone your muscles. improve joint movement and stability. can get you out of pain. “In ten sessions you will feel the difference, in twenty you will see the difference and in thirty you will have a whole, new body” – Quote by Joseph Pilates. 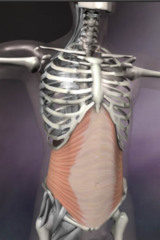 In Pilates, we are targeting the Transversus Abdominis muscle which sits underneath the six-pack abs and the obliques. The muscle runs around the waist, acting like a corset, supporting the pelvis, spine and aiding balance and movement.